A food allergy commonly refers to a reaction to the protein in a food. Food intolerance refers to an intolerance that does not involve the immune system. It is important to know the difference between a food allergy and food intolerance. Although both involve a reaction to food, they are not the same. A food allergy commonly refers to a reaction to the protein in a food. The immune system is tricked into believing that the protein is harmful and thus attacks it. Allergic reactions to food can occur within minutes of eating, or it can take a few hours. Food intolerance refers to an intolerance that does not involve the immune system. It involves a difficulty in digesting or metabolizing a food item. Food intolerance can also involve different systems of the body, though its symptoms may be very similar to those of a food allergy. Food allergy symptoms include itching of the mouth and throat, eczema and skin rashes, difficulty breathing, drop in blood pressure, cramps, nausea, vomiting, diarrhea, swelling of the throat and tongue, loss of consciousness, and even anaphylactic shock that could result in death. If a person suffers from food intolerance, he or she can have symptoms of nausea, cramps, gas, diarrhea, abdominal pain, and bloating. The most common food allergens (or allergy-causing substances) are soy, wheat, tree nuts, shellfish, peanuts, eggs, milk, and shellfish. On the other hand, the two most common food intolerances are lactose intolerance and gluten intolerance. Lactose is a form of sugar that is present in milk, whereas gluten is a protein present in some oats, rye, barley, and wheat. If a person has a food allergy, he or she needs to avoid those foods and other food items that may contain small amounts of that particular allergen. Usually, food labels contain a list of ingredients and one can determine whether the product contains a commonly-known food allergen or not. If a person suffers from food intolerance, he or she needs to avoid foods that cause the symptoms. However, the person may be able to tolerate small amounts of food items, which he or she is intolerant to, without showing any significant symptoms. According to an early study published in the journal Annals of Allergy, it was reported that literature concerning the use and misuse of the terms food allergy and food intolerance is contradictory. When seen from the standpoint of placebo-controlled, double-blind studies, the clinical picture that characterizes both disorders - concomitant signs and symptoms from the skin, respiratory system, and gastrointestinal tract - all appear to be identical. Thus, a distinction depends on the involvement of the immune system. The difficulty with diagnostic tests, such as a skin prick test (SPT) and a histamine release (HR) from basophils, is that in comparison to inhalant allergens, standardized extracts are not commercially available. 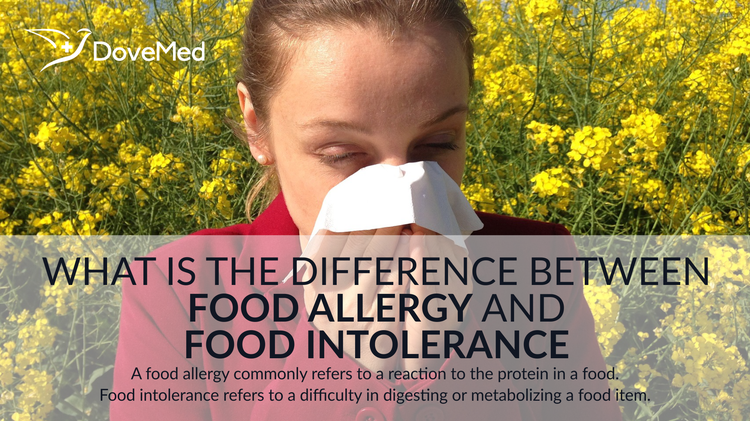 Hence, it becomes difficult to distinguish between the ability of a test to diagnose a food allergy and the differences in allergen extract quality. It is likely that this is the reason for the wide variability in diagnostic specificity and sensitivity reported in literature. Thus, many cases of food allergies could be wrongly diagnosed as intolerance to food due to the low sensitivity of diagnostic tests. Bindslev-Jensen, C., Skov, P. S., Madsen, F., & Poulsen, L. K. (1994). Food allergy and food intolerance--what is the difference?. Annals of allergy, 72(4), 317-320. Schäfer, T., Böhler, E., Ruhdorfer, S., Weigl, L., Wessner, D., Heinrich, J., ... & Ring, J. (2001). Epidemiology of food allergy/food intolerance in adults: associations with other manifestations of atopy. Allergy, 56(12), 1172-1179. Jansen, J. J. N., Kardinaal, A. F., Huijbers, G., Vlieg-Boerstra, B. J., Martens, B. P., & Ockhuizen, T. (1994). Prevalence of food allergy and intolerance in the adult Dutch population. Journal of Allergy and Clinical Immunology, 93(2), 446-456. Anderson, J. A. (1985). Food allergy and food intolerance. ASDC journal of dentistry for children, 52(2), 134-137. Leung, J., & Crowe, S. E. (2015). Food Allergy and Food Intolerance. In Nutrition for the Primary Care Provider (Vol. 111, pp. 76-81). Karger Publishers. Patriarca, G., Schiavino, D., Pecora, V., Lombardo, C., Pollastrini, E., Aruanno, A., ... & Roncallo, C. (2009). Food allergy and food intolerance: diagnosis and treatment. Internal and emergency medicine, 4(1), 11-24. Clarke, L., McQueen, J., Samild, A., & Swain, A. (1996). dietary management of food allergy and food intolerance in children and adults. Australian Journal of Nutrition and Dietetics.